It’s time for serious kitchen fun! Sweet, buttery Cinnamon Raisin Fresh Toast Sticks. Crispy, crunchy Bottom-of-the-Bucket Drumsticks. Ooey-gooey Microwave S’mores. Whether your kids have been preparing their own lunches for years or are just starting out in the kitchen, Dad’s Book of Awesome Recipes is your all-in-one guide to helping them create tasty meals your whole family will devour. From PB&J Bites and Veggie Rolls to Pasta alla Carbonara and Cheesy Rice–Stuffed Tomatoes, this cookbook offers step-by-step instructions for concocting a variety of yummy dishes that are perfect for snacktime, breakfast, lunch, and dinner. Bursting with 100+ kid-friendly recipes, each page helps you inspire your little chef to take the lead in the kitchen and make culinary creations of their own. 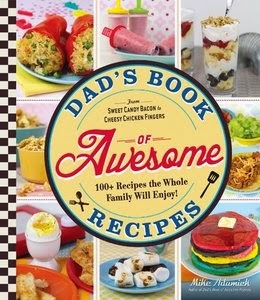 Complete with advice on teaching them cooking basics, Dad’s Book of Awesome Recipes encourages you and your kids to unleash your creativity as you whip up tasty meals in one of the most fun rooms in the house!